In 1725, the early workhouse directory, An Account of Several Workhouses..., noted the existence of a workhouse at Hatfield Broad Oak. A parliamentary report of 1777 recorded parish workhouses in operation at Great Dunmow (for up to 50 inmates), Felsted (20), Bardfield Saling (12), High Easter (33), Hatfield Broad Oak (60), and Thaxted (50). 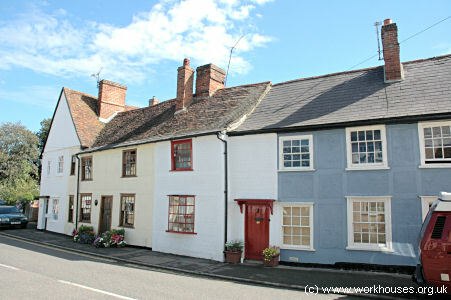 Great Dunmow's parish workhouse consisted of three adjacent buildings occupying what is now numbers 43 to 61 at the east side of the High Street. The buildings were sold off on 27th October 1840 at an auction at the Saracen's Head Inn. Lot 1, with a street frontage of fifty feet, had formerly contained the dining hall, matron's room, kitchen, bread room, coal place, and shoe place, with outside sheds and a water pump. Lot 2, with a similar size frontage, had contained the men's keeping room, mill house, engine house, and yard with sheds. Lot 3 had a High Street frontage of sixty feet and included the entrance gateway, governor's office, boys' room, yard and sheds. At the same sale, the parish disposed of four cottages on Dunmow Down which were presumably former poorhouses. 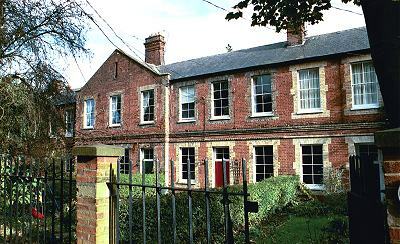 Dunmow former High Street workhouse buildings, 2006. Thaxted's parish workhouse probably dated from around 1710 when a small establishment was instituted on Newbiggen Street. A new and larger building was erected, probably on the same site, in 1724-5. Overseers records for this period note the supply to the workhouse of malt and hops for the brewing of small beer, and a payment of six shillings for a coffin for Mary Poulter plus a shilling and sixpence for the digging of her grave. The Thaxted workhouse was larger than most in the area. At the sale of the building in 1841, the frontage to the High Street (now 44-48 Newbiggen Street) was almost 100 feet. The master's quarters alone extended to four rooms (two on the ground floor and two above), and the southern end of premises included a "newly erected substantial brick and slate infirmary". 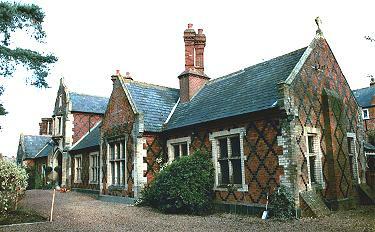 Thaxted former parish workhouse, 2006. High Easter had a small parish workhouse by 1740 accommodating around for inmates. Larger premises were in use by the 1770s at the south side of the main street. A new workhouse was erected on the site in 1781. Initially, the master was employed at a flat salary five shillings per week, with the parish overseers providing the inmates food, clothing etc. In 1781, a new system was introduced where the master received 2s.6d. per week for each inmate under his care, but out of this had to provide for all their maintenance. The workhouse was five rooms wide on both the ground floor and its upper floor. 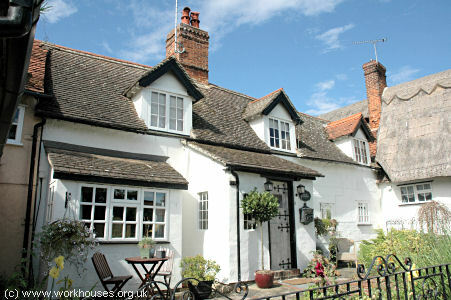 It was sold off in 1835 as five cottages, but had now been converted into two. High Easter former parish workhouse, 2006. 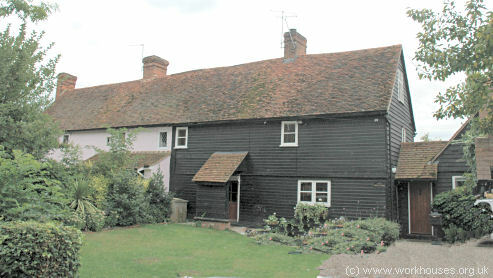 Felsted's parish workhouse was in a row of cottages dating from around 1600 and situated on what is now Garnet's Lane, formerly known as Workhouse Lane. In 1777, the Felsted vestry appointed John Cornell of Stebbing as master of the workhouse at £3 per week to provide at least twenty persons with meat, drink, clothing, washing, lodging, and firing. He would receive and additional 30s. for each woman in labour, for a period of up to 28 days. The workhouse bedding, brewing equipment, and spinning wheels were provided by the parish, while the master received an allowance on 5s. per quarter for brooms, mops, and pans. 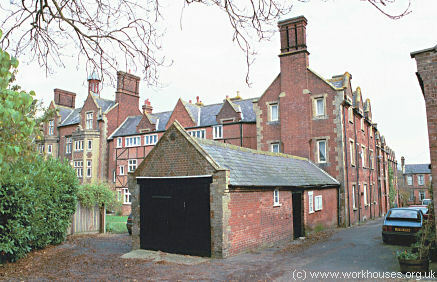 Felsted former parish workhouse, 2006. 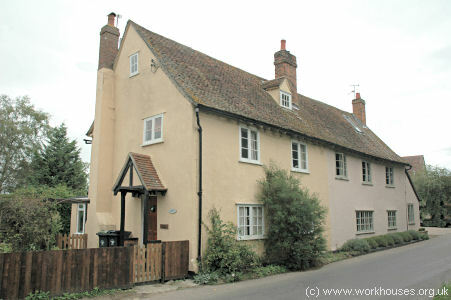 A cottage, still known as "The Old Workhouse", at the west side of the main road through the Great Easton was presumably once used for this purpose. Great Easton's old workhouse, 2006. County of Essex: Great Bardfield, Little Bardfield, Saling Bardfield [Bardfield Saling], Barnston, Broxted, Great Canfield, Little Canfield, Chickney, Great Dunmow (3), Little Dunmow, Great Easton, Little Easton, High Easter, Felstead (2), Hatfield Broad Oaks (2), Lindsell, Aythorpe Roothing [Roding], High Roothing [Roding], Morrell Roothing [Roding], White Roothing [Roding], Stebbing (2), Takeley, Thaxted (3), Tilty. The population falling within the Union at the 1831 census had been 18,769 — with parishes ranging in size from Morrell Roothing (population 32) to Great Dunmow (2,462). The average annual poor-rate expenditure for the period 1831-34 had been £20,109 or £1.1s.5d. per head of the population. 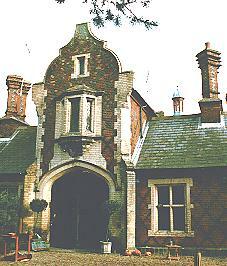 Dunmow Union workhouse was erected in 1838-40 at Great Dunmow. It was designed by George Gilbert Scott and William Bonython Moffatt where were the architects of many other workhouses during this period including ones for the Witham, Billericay and Tendring Unions. The Dunmow workhouse was erected on a site to the east of the town on the north side of the road to Chelmsford. It cost about £8,000 to build and could accommodate 350. The workhouse location and layout are shown on the 1896 map below. Scott and Moffatt's design for Dunmow was in an Elizabethan Tudor style, and its layout was similar to many of their other workhouse plans. 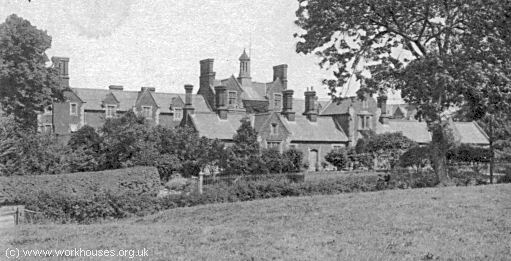 Dunmow general view from the south-west, c.1910. Dunmow general view from the south, 2000. The plan featured a single storey entrance range with central archway. This block would have contained the porter's lodge and Guardians' board-room, with a chapel at its eastern end. Dunmow entrance range from the south, 2000. The entrance archway contains a large metal spike, possibly the origin of one of the workhouse's nickname of "the spike". 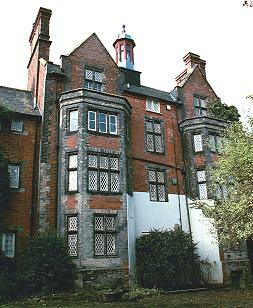 Dunmow main block from the north-east, 2000. A separate infirmary was erected to the south of the workhouse in 1871. 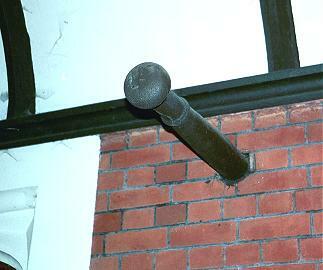 It was designed by Fred Chancellor who was also the architect of the Chelmsford workhouse rebuilding in 1886. During the First World War, the site was used as army and refugee billets and from 1917 to 1919 as a prisoner of war camp. The workhouse never re-opened and by 1925 the premises had been converted into thirty cottages, the site then becoming known as The Close. 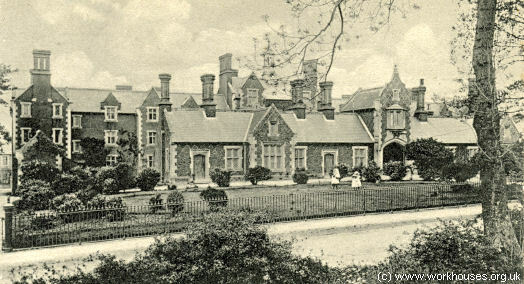 Dunmow general view from the south-west, c.1905.